Advanced Planning – Herman Meyer and Son, Inc.
At Herman Meyer & Son, Inc., we believe a funeral service represents a unique opportunity to celebrate the life of a loved one – the memories, the values and the accomplishments. It’s also an important part of the grieving process. That’s why our caring and supportive staff is trained to provide the very best in personal service and attention to help you through this difficult time. According to the National Funeral Directors Association (NFDA), approximately 98 percent of American funeral homes offer pre-planning options to families in their communities. Among the biggest reasons families prearrange is the peace of mind that comes with knowing a spouse or child will not be left with making important decisions at a stressful time. Pre-planning ensures the family that their loved one’s final wishes will be met. Many families are comforted knowing the funeral reflects what their loved one wanted. Preplanning may or may not involve prepaying. NFDA recommends prearranging for everyone and suggests discussing with a licensed funeral director the benefits prepayment can offer. 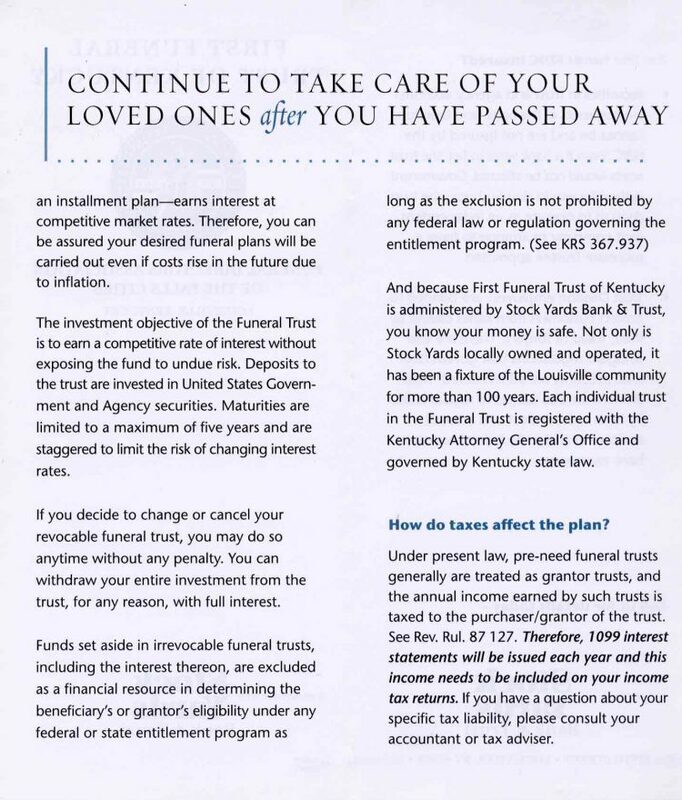 There are generally two basic ways to prepay a funeral. In the event the purchaser of the plan moves, is the pre-funded plan transferable? Once you’ve made your prearrangements, keep a copy of your plan and any pertinent paperwork in a safe place and inform a close friend or relative what arrangements you’ve made and where the information may be found. One of our funeral directors can walk you through the prearrangement process. NFDA recommends prearranging for everyone and developed the Bill of Rights for Funeral Preplanning as a resource for understanding what to expect from a preneed contract. To assist you in planning ahead of time, we have created several pages of information to aid in what might be considered, to some, an overwhelming task. To answer many of the common questions people have, a good place to begin is the Frequently Asked Questions page. After reading through what others have asked, you can move on to the Helpful Funeral Guidelines. The Helpful Funeral Guidelines page provides a checklist of important things you may wish to consider in preparing for the tasks that lie ahead. The final page to assist in planning ahead is the Individual Service Profile form. You may fill this form out online, or you may simply print the form and hand write the information. Our intention with this page is to help you organize some of the important information that will be needed at the time funeral arrangements are made. The information you provide will assist us in obtaining death certificates, preparing obituaries and other vital tasks related to the funeral service. Please take a few moments to fill the form out as thoroughly as possible. Then, you can either return it to us or keep it in a safe place.